Meghan Daum may be the L.A. Times equivalent of Maureen Dowd in the New York Times. Her political columns are witty and acerbic, attacking idiosyncracies with the smile and parry of Jon Stewart – funny with underlying truth. Although I have sworn off memoirs, I read her latest book – looking for that humor and zing. Life Would Be Perfect If I Lived in That House did not disappoint. Daum refers to using the royalties of the novel she wrote while in Nebraska – one of her many places to live – to ultimately buy a house. 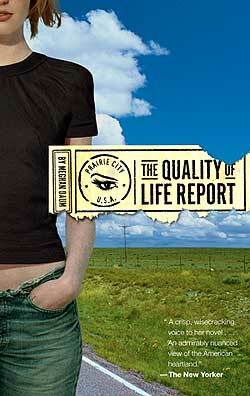 I found that novel – The Quality of Life Report. Although fiction, the book matches some of Daum’s brave revelations about her personal life in her exaggerated memoir – you write what you know? The character Lucinda Trout might have been having the same adventures as Meghan Daum, but I had read the nonfiction sequel, and Lucinda was (mostly) fiction. In the novel, after a visit to Prairie City, Nebraska to cover a news story on drugs, and noting the difference in rentals – 1000 square feet for $400 a month compared to her New York 400 square foot rental for $2000 – Lucinda Trout creates a documentary project that would have her feeding reports on “the quality of life” from her on-site experiences over a year from Prairie City. Lucinda’s New Yorker sensibilities confronted with rural life of coyotes and truck stops give Daum the opportunity to demonstrate her cynical humor as Lucinda explores her new surroundings. Mason Clay, a combination Sam Shepard/Brad Pitt, grain elevator operator with three children from three different women, becomes the love interest – an echo of the Nebraska “ex boyfriend” Daum often references in her memoir. While the book was funny in places, it didn’t hold the same interest for me as “Life Would Be Perfect…” I had been fascinated with Meghan’s real adventures; when I read them as pieces of a fictionalized venture with Mason – not so much. But I still like Daum’s style – maybe the next book will reel me back in. 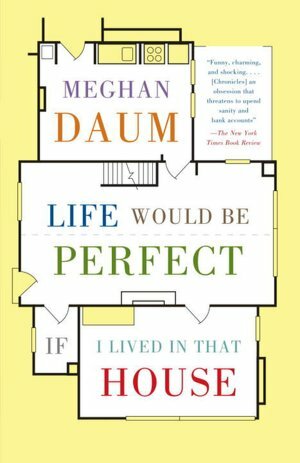 Using the recent real estate debacle as the beginning and end of her story, Meghan Daum’s humorous memoir resembles the style in “Eat, Pray, Love” – but Life Would Be Perfect If I Lived in That House is much better written, funnier, and even offers cautionary advice to those seeking perfection in a place. Always alert for that next place, Daum introduces her family and friends with their laughably exaggerated foibles but with enough realism that you might recognize their characteristics in some people you know. Meghan’s mother only finds perfection when she gets her own place; I understood her constant state of anxiety, trying to fit into a house/neighborhood/lifestyle. In her first person narrative, Daum seems to be talking to you, “dear reader.” Her conversational style includes her obsessed scouring of Craigslist, open house tours, and decorating fantasies, until she ultimately manages to overdo some details – especially in her early years. But as she marches through Vassar, post-college, and her thirties, the search for good real estate sprinkled with her own anxieties will keep you reading. When she finally finds a house (a fixer-upper beyond help), depleting her savings at the height of the real-estate bubble, and settles into enjoying her solitude, of course, she finds a guy. Her angst at giving up closet space and the freedom to eat salami over the sink will have you smiling, but the reason they finally decide to take the plunge and move in together will ring true to any city dweller who has tried to find a parking space. Witty and sometimes laugh out loud funny, Life Would Be Perfect If I Lived In That House does have a moral to the story at the end – one well-known and often ignored – a house is just a place after all; a home is what you make it. Daum uses her royalties from the sale of her novel to buy that house; I plan to find her book. She left me wanting more.